The risk of Ovarian Cancer increases with Age. Most are diagnosed after age 60, and women older than 65 account for half of all cases. **IMPORTANT – Just because you are statistically less likely to be diagnosed with Ovarian Cancer if you are younger, do not let this fact deter you from consulting a physician if you have the persistent symptoms listed above. A 38 young woman from my neighborhood was recently diagnosed with ovarian cancer, so it can happen in younger women as well. Family history is another risk factor for Ovarian Cancer. Your risk is increased by three if you have a close relative with the disease. 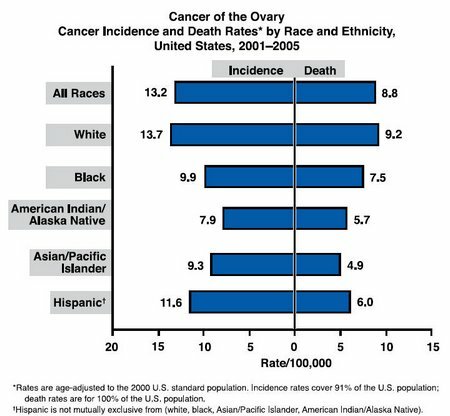 Ethnicity: European and North American white women have the highest incidence of ovarian cancer, with black women showing the lowest rates. Asian women living in Asian countries have a low risk, but this changes if they move to a Western country and assume the Western diet and lifestyles. Childbearing History: Risk is increased for women who have few or no children, or who have not born a child until after age 35. THose somen who are menopausal after age 50, or who started menstruation before the age of 12 are also at higher risk. Taking birth control pills may lower the risk of ovarian cancer, but women who have previously been diagnosed with breast or endometrial cancer have an increased risk of ovarian cancer. The bottom line is to become familar with what is “normal” for your body, and pay attention to any unusual symptoms that you may experience. If in doubt at all, bring any changes in your bowel or bladder habits to your doctor, especially if accompanied by pain in your abdomen. If you’ve laready seen a doctor and have not been diagnosed with ovarian cancer, but your symptoms are not being relieved, notify your doctor and make an appointment for another visit, or get a 2nd opinion from a different doctor. Ovarian cancer does have symptoms and the chance of being cured if it is caught early is from 85-90 percent. So pass this article along to your friends, neighbors, and colleagues, so that all women know the warning signs of ovarian cancer. I think the hard part about symptoms of ovarian cancer are that they are often so subtle. And women who visit their physicians are often times treated as if they are overemphasizing even very troublesome symptoms. So on one hand we are encouraging women to “ask their doctor” about certain things, while on the other hand the medical profession tends to “dismiss” certain symptoms.